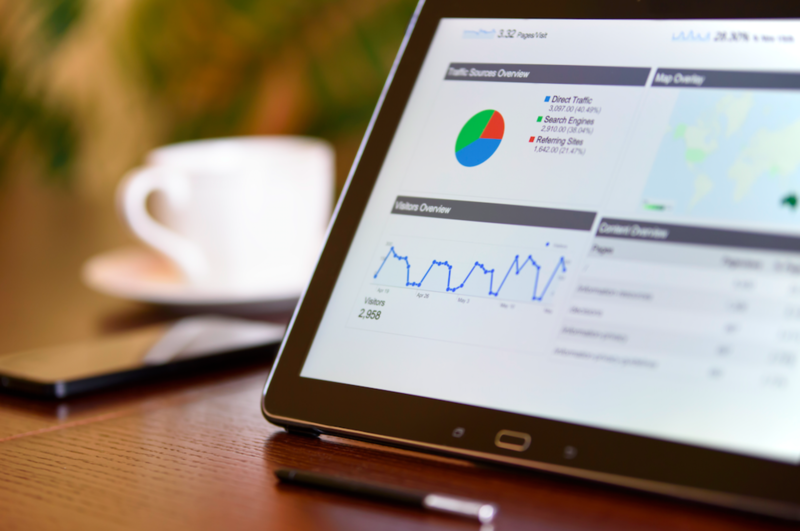 All of the business metrics you need to track and how to view them on your digital screens. If there’s one thing that’s come to light in business and marketing over the last few years, it’s that the numbers matter. From getting investments to tracking your team and ensuring everyone is on the same page, it’s the metrics that row the boat. But what if you aren’t sure what business metrics you should be tracking or how to make the most of them? Business metrics determine the measure you use to see if your company is successful. The thing to remember about metrics is that it’s all about context. What might be a great MRR (that’s Monthly Recurring Revenue) for one company will be bad news for another. This is why business metrics are incredibly personal to what your company wants to achieve. Monthly Recurring Revenue (MRR): This is how much money you can expect to receive each month on average. The reason this is more important to us over say, monthly profit, is because many of our customers are on subscriptions. This means that if they paid annually rather than monthly, the profit for that month would look amazing. However, the next month, it would look like there was a huge dip, as they wouldn’t pay another annual fee. MRR gives you an average of what all of your customers (monthly or annual) would pay over the year. Active screens: This is fairly personal to the ScreenCloud mission, as our entire team has a goal to enable a specific number of screens within a specific amount of time. This would be an irrelevant business metric to many, but it really works for us to focus the mind and the company. Conversion rate: This is the number of people you target or who try your product/service that turn into customers. This is a commonly useful business metric for most, as it ties into everything from sales and marketing to production and customer service. If your conversion rate is low, there’s something not quite right that you need to fix. Churn rate (the number of people who cancel their product or sale) also plays into this, as if you have a high conversion rate and a high churn rate, you’re likely to remain standing still. Customer Acquisition Cost (CAC): This is how much it costs you to get a customer. For example, if you spent $100 on marketing activities and you received two customers from those activities, your CAC would be $50. Customer Lifetime Value (CLV): Once you have your CAC, it’s useful to compare this to the lifetime value of each customer. This helps put your CAC into perspective. For example, if a customer costs you $100 to acquire and their lifetime value is $500, you’ll make a $400 profit per customer. However, if they cost $100 to acquire and they only spend $120 with you before they churn, your CAC is much lower. Customer loyalty: A common way to measure customer loyalty is to use the Net Promoter Score (NPS). This reviews customer loyalty based on how likely the customer is to recommend your company or service. On a scale of one to 10, one meaning that your customer is unlikely to recommend your company and 10 meaning that they are highly likely to recommend it. NPS is often used to find crucial areas and gain feedback on where a company can improve. To calculate a NPS you need to subtract any detractors (those who scored you 6 or less) from the amount of promoters (those who scored you a 9 or 10). So, if 10 customers gave you a 5 and 20 gave you a 9, your Net Promoter is a score of 10. Net Profit Margin: This is the money that’s left after you take out all of your expenses. It’s a good measure, as it tells you how long your “runway” is depending on the cash you have left against your average expenses. Sales Conversion Rate: This is how many of your leads turned into sales. For example, if your sales team went on 15 appointments in a month and you won 2 jobs from those contracts your sales conversion rate would be 13% (2/15*100 = 13). You can do this by individual channel, for each sales member or across the entire company. Sales Growth Month-on-Month: This can be adjusted depending on your business model. It helps you to determine how well your sales and/or marketing activities are at generating leads and customers pipelines. Website traffic: How many users are accessing your website each month. Of course, there are lots of other business metrics you might want to track across sales and marketing, such as website traffic, organic lead acquisition, and number of sales qualified leads. However the metrics above are the ones that are more closely linked to your overall business, rather than specific activities or departments. To get you thinking about which metrics are most important to your business specifically, let’s look at some other company case studies. 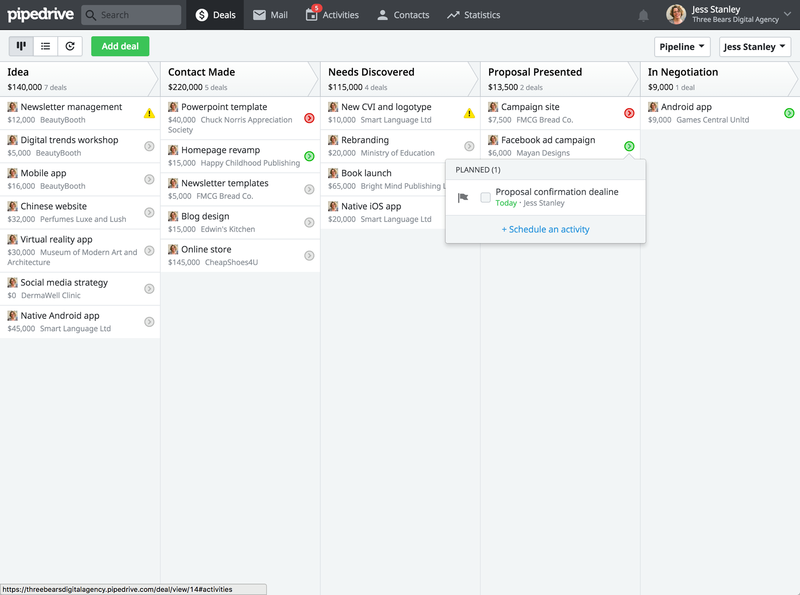 Social media scheduling tool Buffer is widely known for its “full transparency” ethos, which includes giving anyone access to its reporting dashboard. MRR: This is the key metric for Buffer in tracking their monthly revenue due to the same subscription model we mentioned above for ScreenCloud. For Buffer, this means looking at the gross volume from recurring revenue minus refunds and fees. User churn: For Buffer, this includes customers who leave and also who downgrade to their free plan. Live stream of payments: This is shared on the dashboard using fake names. It allows the team to see how revenue ebbs and flows throughout each day in real-time. Average Revenue per User (ARPU): Groove HQ measures the revenue from each user minus the support costs of having three agents per person to get a true figure. Website visitor-to-free trial conversion rate: This shows how many people landing on the Groove HQ website are actually turning into customers. Free trial-to-paid-customer conversion rate: This is different to the above metric, as the customer is further down the pipeline. It’s useful for showing potential product pitfalls where customers are dropping off. Monthly trial signups: This is used to determine how many people they are converting from visitor to trialist. It helps focus their marketing on how they can improve MRR (their number one key metric) by getting more users to convert. Monthly web sessions: This is, again, to contribute to MRR and ensure there are enough users coming to the site ready to hopefully convert into users. 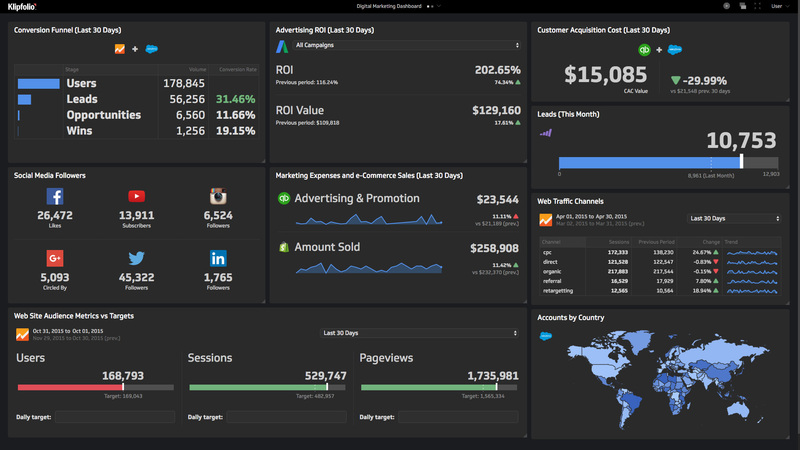 One thing all of these companies—including ScreenCloud—have in common is that we use business dashboards to keep an overview of our KPIs. They organize the data so that you can easily digest the meaning. They place the information front and center of mind as you can easily share a dashboard to your office digital screen. Without this, it’s easy to set up business metrics and forget all about them. Geckoboard is a tool that allows you to turn data from a Google Sheet or Excel file into a visual dashboard. It also allows you to take metrics from tools you already use and create a dashboard, without needing to know anything technical. Once you’ve set up your Geckoboard, you can easily add it to your office screen using the Geckoboard app. Klipfolio is a great app for taking all of the tools you use to measure your business and connecting the meaning from those tools together. Integrations include Mailchimp, Recurly, Salesforce, SEMrush, and so many more. Once you have the visualizations, you can edit them and add to your digital screens. 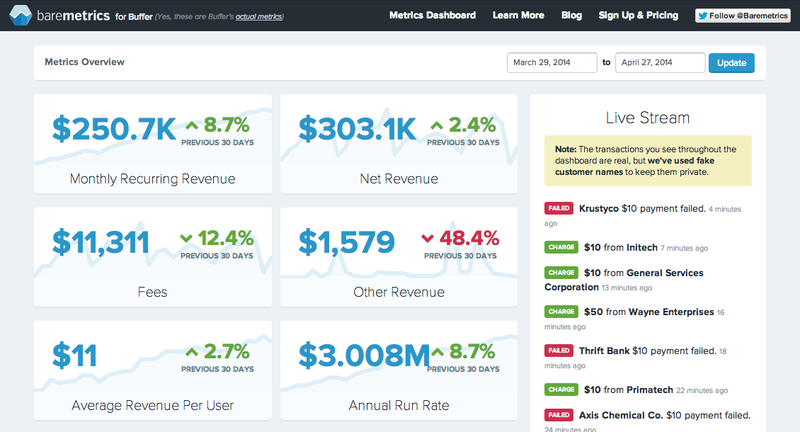 A very popular reporting and dashboard tool is Baremetrics. This advanced tool allows anyone to create a business dashboard for almost any business metric. Unlike some tools, it isn’t restricted to SaaS models. Other metrics you can show include customer profiles, refunds, and marketing campaigns. Most of the tools we’ve focused on so far look at metrics tracking. But measuring the health, happiness and needs of your employees is just as important. 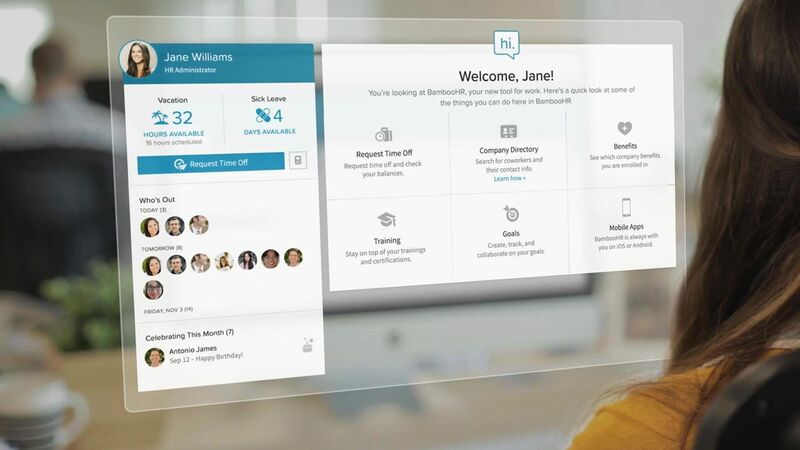 BambooHR is an HR platform that allows you to track employee-centric metrics like time-off, performance management, birthdays and start dates. Best of all, you get an easy-to-view dashboard with all of the key information you need at a glance. Pipedrive is a sales CRM tool for small to mid-sized businesses. It has many similar features to a more advanced CRM like Salesforce, but its benefit is in being easy to use. Its lightweight interface gives you features to track, review, and see what’s going on in your sales flow and by team member at a glance. It’s also only $12 per month for up to 2,500 contacts, with lead scoring, lead segmentation and sales reports all included. 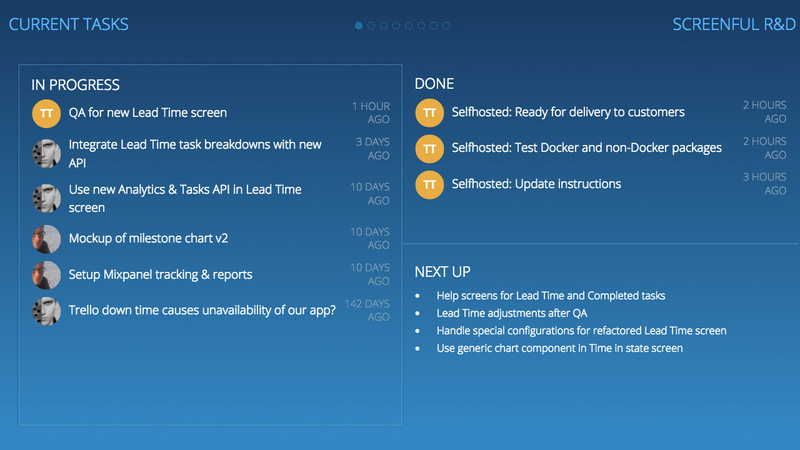 Screenful helps you develop business dashboards from tools you already use, such as Trello, Asana, and Jira. This makes it easy to take your project boards and make them more visual. 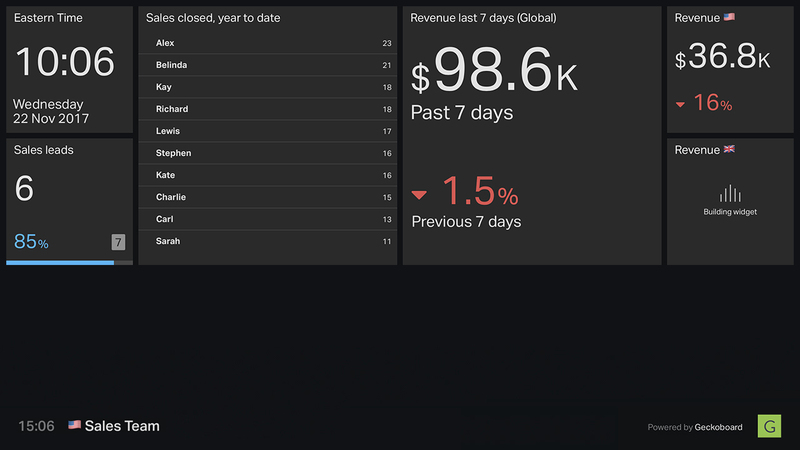 Screenful is especially useful for product development or project management teams, as you can easily add your dashboards to screens in your office, lobby, or meeting rooms to stay on track of what’s going on. 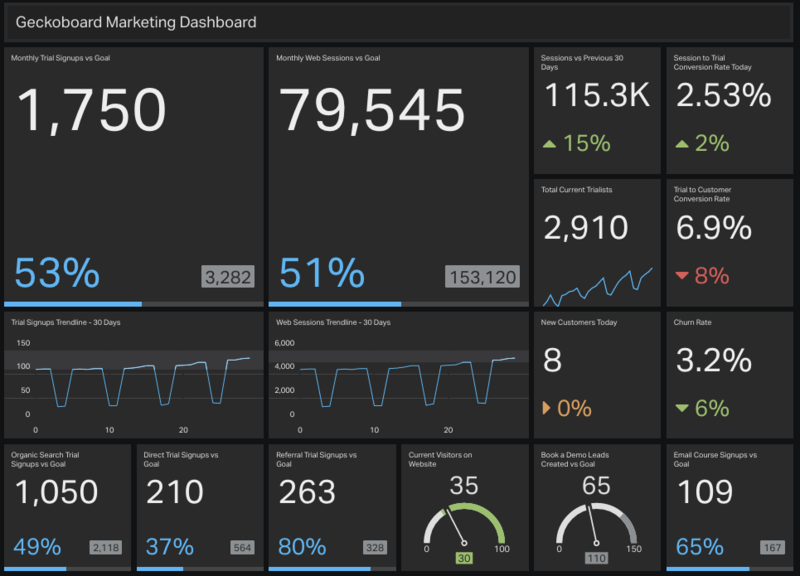 For help adding your business dashboards to your digital screens, check out our 14-day free trial of ScreenCloud.